Enzo Bonafè and Lamborghini: a shared birthday and much more. Both companies were born in 1963 in the Bologna area and share the same passion for superior quality materials, attention to detail, and Made in Italy craftsmanship. Abbottonato, Francesina puntale, Monk strap and Mocassino. Collezione Automobili Lamborghini reflects the philosophy of Ad Personam, the customisation programme which enables each customer to create his or her own personalized Lamborghini. Customers can select their choice of colours, materials, detailing and accessories in line with the style criteria of the Lamborghini brand. The customizable articles in Collezione Automobili Lamborghini include high-end footwear from Enzo Bonafè, as well as other brands like Hettabretz and Tecknomonster. Enzo Bonafè equals attention to detail and passion. The use of high-quality materials and traditional craftsmanship, along with experience and knowledge, coming together to create a high-quality product, to satisfy every customer’s requirements. 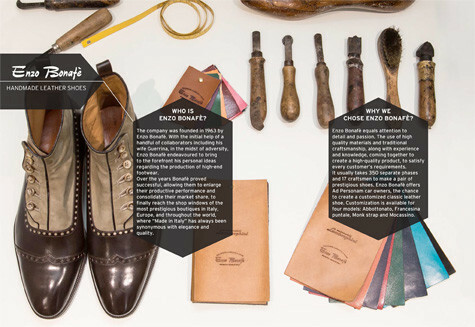 It usually takes 350 separate phases and 17 craftsmen to make a pair of prestigious shoes. 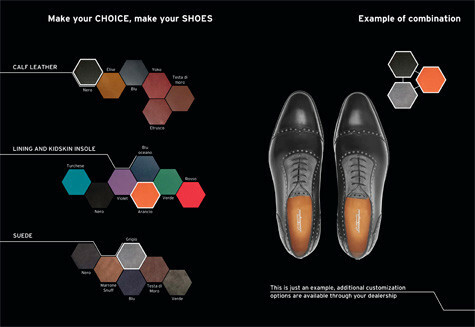 Enzo Bonafè offers Ad Personam car owners, the chance to create a customized classic leather shoe. Customization is available for four models: Abbottonato, Francesina puntale, Monk strap and Mocassino. Luxury is no longer just about high quality, performance, and design but is evolving towards the search for exclusivity, which is expressed by means of customization. More information about Ad Personam, customization program, visit Automobili Lamborghini official website or refer to a Lamborghini distributor.